Holidaying in the UK offers a chance for Brits to keep their travel costs down while still having a fantastic time in a wonderful environment. There are some incredibly beautiful parts of England, Scotland and Wales waiting to be explored, and unless you’ve visited them all, you’re sure to find somewhere ideal for your next break. By booking in at one of the UK’s five-star holiday parks, you can secure yourself and your travelling party an enviable level of luxury amid an abundance of outdoor space and a variety of facilities. Holiday parks are typically designed to engage and excite holidaymakers of all ages but of course they offer every chance for visitors to check out surrounding areas or sites of particular interest as well. With 5-star accommodation at a holiday park, you’ll find not only added comfort and quality accommodation but very often a hot tub and access to fully heated indoor swimming pools. So, even if the weather isn’t as warm as it might be, there will always be a huge amount to enjoy and get involved with, as well as every opportunity to relax in style. The cost of staying in 5-star holiday parks UK can vary considerably but if you book far enough in advance then there’s every opportunity to secure a good deal. An important appeal of these offers and holiday park facilities though is that once you’ve arrived, you’ll have nothing else to worry about. Entertainments are often provided with all age ranges and different interests in mind and there tend to be so many activities available that you might find yourself spoilt for choice. If you have young children or you’re young at heart then holiday parks in the UK offer a great value way to have a truly memorable week or so. And a stay at any British holiday park can also provide the perfect basis for time spent exploring some of our more spectacular seaside or rural regions. If you love Britain and there are areas you’re keen to visit and enjoy, then booking a stay at a 5-star holiday park could be your ticket to a series of unforgettable adventures. 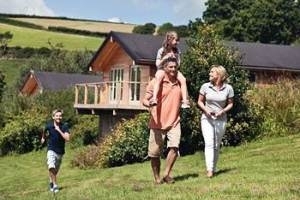 So, why not browse our selection of five-star holiday parks and see what catches your eye?